KTR Promotions in Venice Beach & Los Angeles California: December 8th, 2018, Montana Avenue Holiday Walk Lights Up Santa Monica! December 8th, 2018, Montana Avenue Holiday Walk Lights Up Santa Monica! On Saturday, December 8, 2018, from 4–8pm, Santa Monica’s Montana Avenue Holiday Walk will be in full swing. Come celebrate the holidays with a free event featuring live music, Santa Claus, the Grinch and Cindy Lou. The event runs from 6th street to 17th. Each year all the merchants get involved. Locals come out to mingle and ring in the holiday season. Retailers offer all sorts of deals plus many give away cookies, cider, etc. Check Montana Avenue’s instagram as there will be a contest — post a pix of the grinch, with what street you found him on, and tag @montanaavesm — you will automatically be entered. There will be a Disney Princess Caroling group as well. Montana Avenue supports local schools by partnering them to help raise funds. Many of the students will participate in the event. The Off Their Jingle Bell Rockers will be performing holiday classics, plus their own original songs. 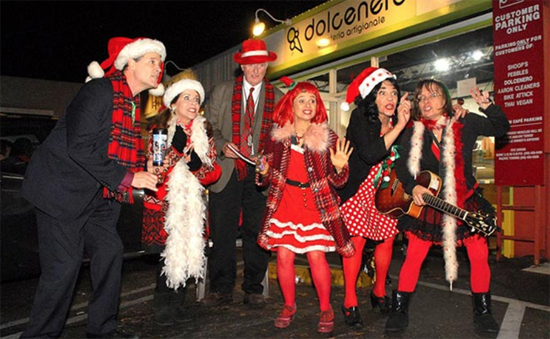 This zany group of professional performers have been caroling together for the past fourteen years. You can find the Off Their Jingle Bell Rockers on the south side of Montana Ave …between 6th and 17th streets. Texture a wonderful assortment of sweaters, cardigans, pullovers, in both bright and muted colors, tweedy solids to polka dot. It also sells beautiful one-of-a-kind scarves. TEXTURE: the Sweater Store & More, 716 Montana Ave., Santa Monica, CA; (310) 393–0707; See FB page. Ten Women on Montana is an artist’s co-operative gallery showcasing local artists. Enjoy specials and light refreshments. Ten Women Gallery, 1128 Montana Ave., Santa Monica; 310–393–6254. On the North side of the street…heading east, you come to Exir (1134 Montana Avenue). Tonight, enjoy a special performance by the children of Chord 2 Cure, a non-profit organization benefiting pediatric cancer research. Be sure to stop by to see a performance by these amazing kids. Back on the south side…If you haven’t been to Le Macaron…you will love these delicate sweets. Le Macaron is located at 1301 Montana Avenue at the corner of Euclid. Ama Asamoah is the manager of Jigsaw’s operations for Southern California, and re-located from London a year ago. 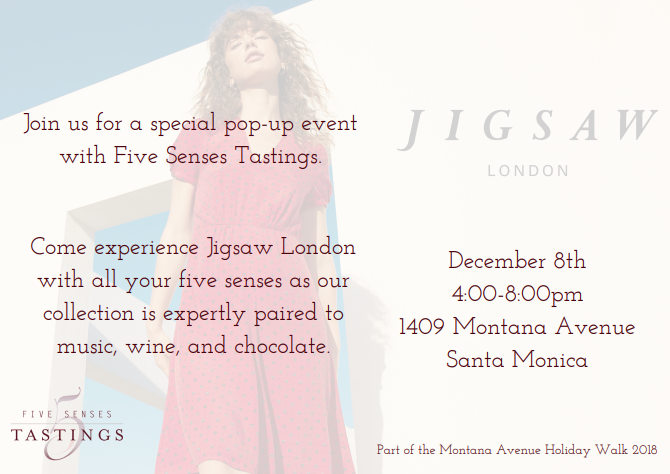 This year, Jigsaw will be collaborating with Five Senses Tastings and hosting a pop-up event. 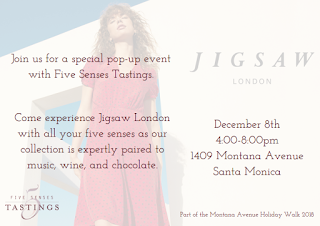 Participants will taste the clothing along with chocolate, wine, cheese, and music, the experience is meant to include all five senses. Jigsaw is also running a sale (up to 50% off) on selected accessories for this special night. Jigsaw, 1409 Montana Avenue. Kiehl’s on Montana is participating this year with 20% all purchases for Montana Walk only! This old-world apothecary was founded 165 years ago in New York’s East Village neighborhood. Stop in to purchase these most loved products at great prices for your loved ones. They make for great stocking stuffers. Kiehl’s on Montana, 1516 Montana Avenue. Head to 16th Street…and you will find a three piece band called the Ledbetter Blues Band near Citron Santa Monica, located at 1615 Montana Ave.
Blending old school blues with a modern funky energy, Ledbetter Blues Band knows how to turn up the heat. Front man Louis Ledbetter has the blues running through his veins. The great grandson of Huddie “Leadbelly” Ledbetter, he’s been playing the blues as long as he can rememer. 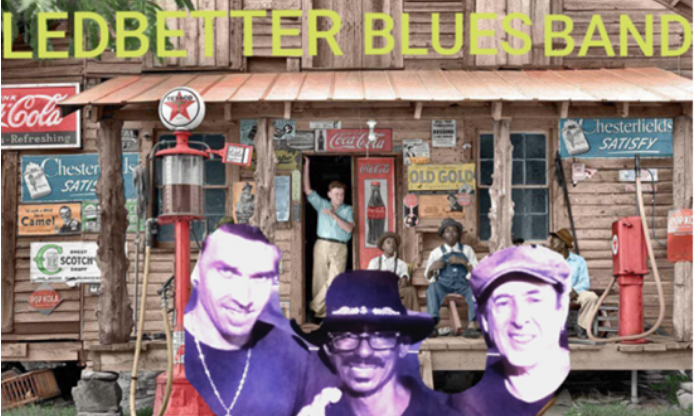 In 2017, Ledbetter joined pro musicians Erick Brassfield and Rick Bryan to form the Ledbetter Blues Band. Check out the Ledbetter Blues Band FB Page. I have to say I absolutely loved going to this place the other night. The people that work at rental spaces for parties here were trying to create an optimal dinner experience while making your choices their priority. I would definitely recommend this venue for any kind of fancy event.